Who can collect the most blossom pairs? 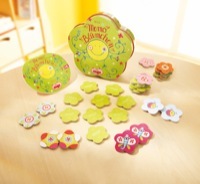 A flowery memory game for 2 to 4 players. Card with glitter and tactile textures. Recommended for 4-99 years old.